Over the Counter Teeth Whitening: Effective or Not? One of the most common things people wish they could change about their smiles is the shade of the teeth. A whiter smile makes the patient look younger, healthier, and more attractive. Nowadays, there are a plethora of over the counter teeth whitening products available – but do these products really work? Whitening strips, toothpastes, and rinses are widely available at drugstores everywhere. They may provide some degree of improvement, but patients should understand that they will not provide the same results as a professional treatment in most cases. Over the counter whitening products promise noticeable results, but users often must use them frequently and over a long period of time to achieve whiter teeth. For people who want to quickly whiten their teeth, an over the counter product is not the best choice. Though users can obtain some results from these products, they are often not as effective as they had hoped. Over the counter teeth whitening products usually provide limited results because they only reach surface stains, not the stains that have settled into the enamel. For deep stains, professional treatments are needed. In-office, professional teeth whitening treatments are, by far, much more effective than over the counter products for patients who desire whiter smiles. Professional teeth whitening treatments go beyond the surface to reach deep stains and reveal a whiter smile. They utilize powerful whitening agents and are administered by an experienced dental professional. 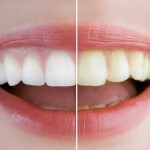 Going in for professional whitening treatments will provide results much more quickly than an over the counter method. Patients usually see noticeable results when they leave their appointment. 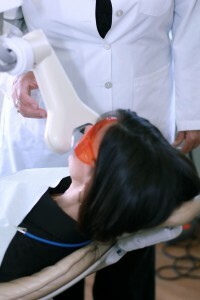 Plus, after a professional teeth whitening treatment, it’s easy to maintain the whiter smile. Patients can use powerful at-home whitening kits provided by the dentist to make sure their teeth stay bright. In short, some over the counter whitening products may improve the shade of the teeth, but for patients who seek significant results, in-office teeth whitening treatments will be much more effective. If you’re serious about getting a whiter smile, a visit to a cosmetic dentist for a teeth whitening treatment is in order.